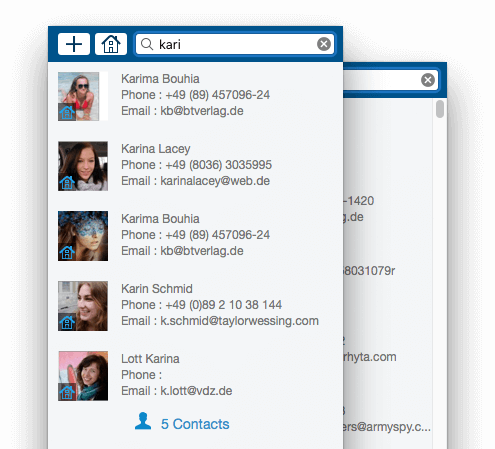 The best selling contact manager software that keep all your contacts organized, synced, and up-to-date! Import contacts from CSV, vCard, and sync contacts from Google, iCloud, Exchange, Facebook, Twitter, LinkedIn, etc. 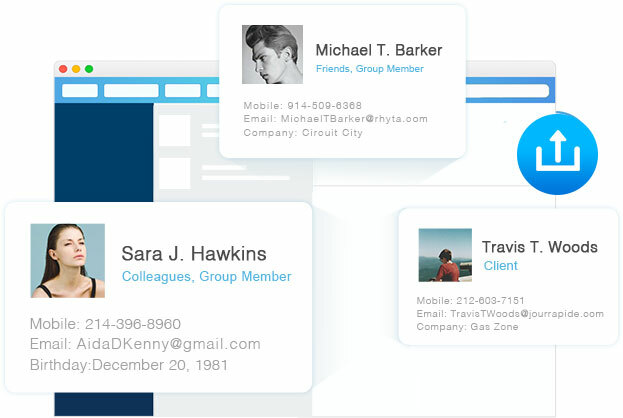 Easily view, add, edit, group, tag, and manage contacts. Delete duplicate contacts, fix formatting errors. Share, export and back up contacts to quickly exchange information. Contact manager enables you to easily import contact or contact lists directly from a .CSV or vCard file, so you are now ready to manage your local contact lists. 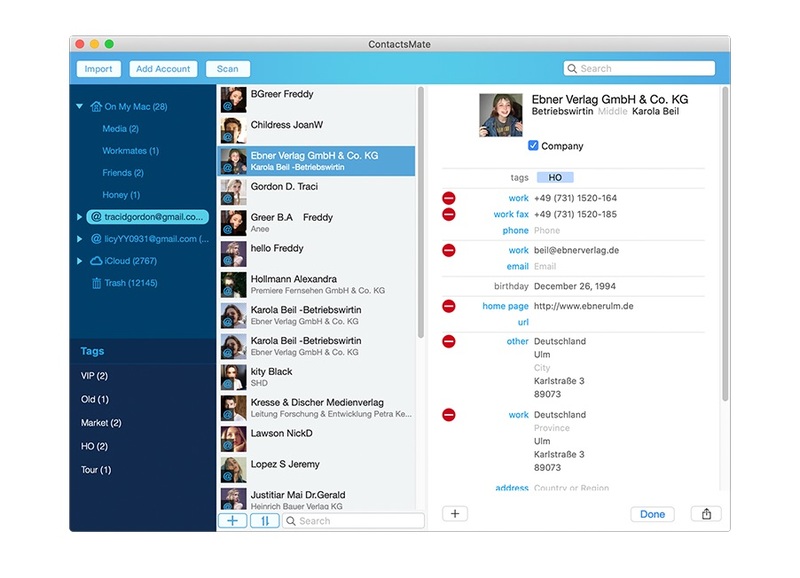 Contact manager syncs with the built-in Contacts app on Mac and supports all leading cloud services, including iCloud, Google, Exchange, Facebook, Twitter and LinkedIn, etc. Manage contacts by groups based on sources, interests, affinities, etc. Apply a tag to sub-categorize contacts. Quickly find what you want with the intelligent multi-conditional search feature. Send group messages, emails or start a call to your assigned lists of contacts. Easily add and edit custom fields using the best contact management software. Print mailing address labels for holiday card envelopes. "Discovered somewhere between oodles and a slew of errors...can immediately swap to ContactsMate or any other such app without exporting or importing data..."
"Quickly import your contacts and clean your database, effortlessly identify the entries that need your attention and more, unsophisticated..."
"The ability to clean your contact list of duplicate items is the program's major asset. This way, the utility automatically scans your address book..."
Automatically scans your contacts for exact duplicates and flags them for removal. Once flagged, you have the opportunity to review one or all of the duplicate contact groups before processing. Or, simply remove all duplicates with one click. Wow, that's easy! Group all compatible duplicate contacts together to be safely edited, updated or merged. Compatible duplicate contacts are contacts that have two or more matching fields. Once flagged as a potential duplicate contacts, you have the opportunity to dig through scan results and handpick the files to erase, update, etc. Save yourself the hassle of wondering which entry is correct. Contact Manager also scans your address book for formatting errors, including invalid characters, incomplete name, blank name, etc. and it will group errors into similar kinds. Allows you to determine the logic of fix that group(merge, delete, neglect, etc.). 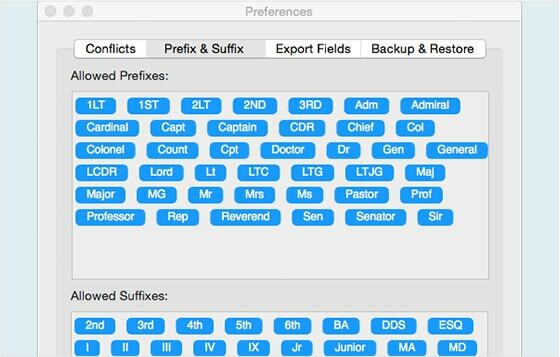 Long awaited suffix and prefix settings have landed on the contact management software to help more accurately find unusual suffix and prefix in contacts list. Now you can add allowed titles and suffixes in your own language, which is very handy for users from non-English speaking countries. Nothing's Deleted for Good — Until You Say So. Every time you want to update and edit your contacts data, you can choose to back up your contacts first, and when you delete a contact, it goes directly to our built in trash, so you never worry about merging or deleting the wrong contacts by mistake. And safely revert your data back to its original condition. Share and Export Contacts to CSV, vCard, Excel, etc. Share Contacts via Mail, Messages, Facebook, Twitter, etc. or export the whole or assigned contacts list to local files in different formats, including CSV, vCard, Excel, TXT, Docx, HTML, Numbers and Pages. Then you can easily backup or import it to Outlook, Yahoo, Gmail, etc. Manage all your contacts in one app. Add labels and properties like address, email and phone numbers to contacts. Easily search or add new contacts from the top right menu bar. Back and restore you contacts easily. Add or delete available suffixes and titles to improve the accuracy of problems scanning. lists and sorts all questionable contacts and provides solution to fix. 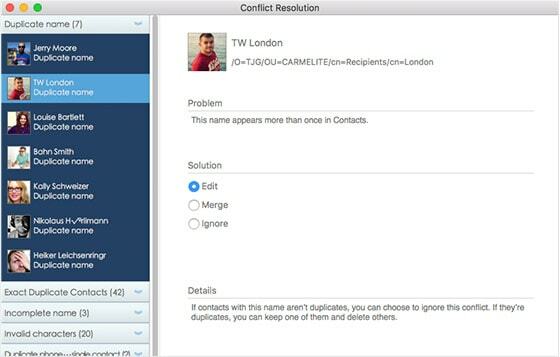 Remove duplicate contacts and compare side by side save yourself the hassle of wondering which entry is correct. 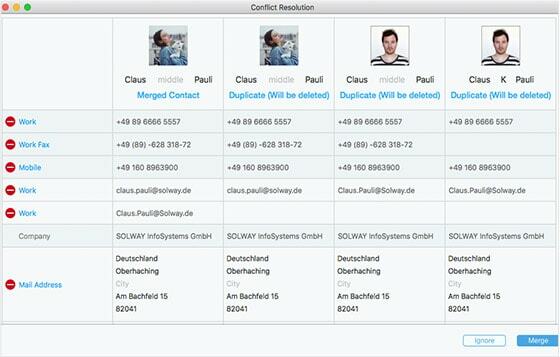 Compare similar contacts side by side to be safely edited, updated or merged. Export contact data to CSV, vCard, Excel, TXT, Docx, HTML, Numbers and Pages. If you don’t need CRM but do need a contact manager that can handle large lists, Cisdem ContactsMate is the one. Spring Cleaning: How to Clean Contacts on Mac (macOS Sierra Included)? Tutorial: How to Delete Duplicate Contacts? How to Delete Duplicate Contacts on Mac (Including macOS System)? 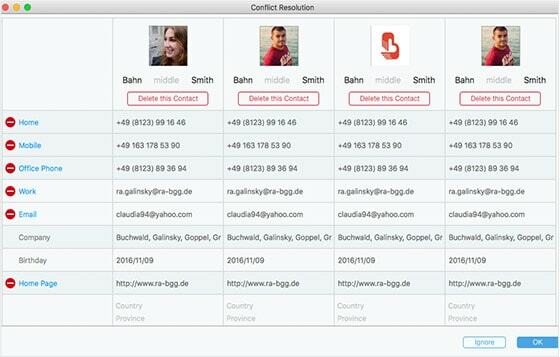 What is the Best Contact Manager for Mac (macOS Sierra Included)? How to Make a Contact Group on Mac (macOS Sierra Included)? How to Group Contacts for Easy Email Sending on Mac (macOS Sierra Included)? How to Easily Organize Contacts on macOS Sierra? 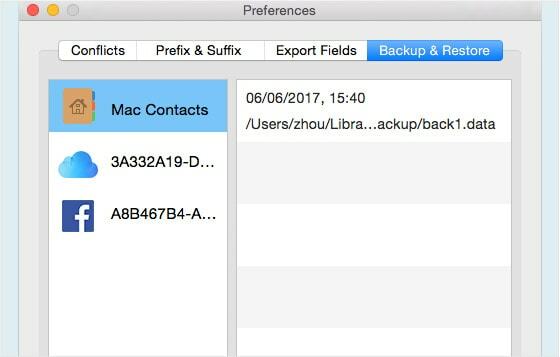 How to Back up Contacts on Mac (macOS Sierra Included)? How to Export Contacts from Mac? How to Export Apple Contacts to CSV and Excel on macOS Sierra?